Lipitor is a type of medication in the form of a tablet, taken to control and manage high cholesterol levels. Cholesterol is a naturally occurring substance that the body needs, it can be very dangerous if your body had too much of it - it can lead to a heart attack, stroke, or blood clots. Although lifestyle can often be a big factor in it, some people have naturally high cholesterol. Lipitor should only be taken once lifestyle changes like a healthy diet and increased exercise have not proved effective in sufficiently lowering cholesterol levels. If you need to take Lipitor tablets, you can buy them online safely from a UK doctor such as Doctor-4-U by completing our simple medical questionnaire and getting a certified prescription. It will be dispatched within 24 hours. Lipitor is a type of medication taken to lower high cholesterol. It is the branded version of the drug Atorvastatin, and should only be taken alongside a healthy lifestyle and low fat diet. It contains an active ingredient which manages your body’s ability to create cholesterol. The long term health impacts of having high cholesterol can be potentially fatal, and if lifestyle changes alone haven’t worked, you may have been advised to diet a cholesterol control tablet such as Lipitor. You need a prescription from a GMC/EU certified doctor in order to buy this medication online. To buy Lipitor from Doctor-4-U, simply complete our online consultation and if you are deemed suitable, we will dispatch your medication usually within 24 hours. If you are not deemed suitable for Lipitor, you will receive a full refund. Do you need a prescription for Lipitor? Yes, you need a prescription from a GMC/EU certified doctor in order to buy Lipitor online. With Doctor-4-U’s easy consultation process, you can get a prescription for Lipitor safely and quickly. Select the item you want to buy, click “Start Consultation” and fill out the short medical questionnaire provided. If you are deemed suitable for your prescription, it will usually be dispatched within 24 hours. If not, you will receive a full refund. What is the difference between Lipitor and Atorvastatin? Chemically, Lipitor and Atorvastatin are the same drug. The only difference is that Lipitor has a brand name on it, which makes it more expensive. There is no difference in the ingredients, side effects, dosage, and interference with other medications between the two products. However, if you have previously been taking Lipitor, and are taking multiple medications that mean you may get them confused if you changed the name/packet type of your painkiller, you may wish to continue taking Lipitor. 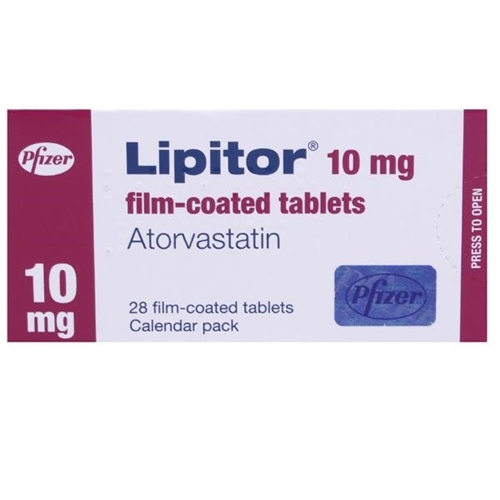 Lipitor contains the active ingredient atorvastatin, which belongs to a family of medicines called statins. Statins work by reducing the liver’s ability to produce cholesterol by interfering with the activity of a certain enzyme. Lipitor should only be taken when lifestyle changes alone have not worked. Although Lipitor is designed for those suffering from high cholesterol, your medical history and other medications may mean it isn’t right for you. What are the side effects of taking Lipitor? The recommended starting dose of Lipitor is one 10mg tablet a day, taken at roughly the same time of day each day. Your doctor may choose to up your dose if there is no clear improvement, up to a maximum dosage of 80mg a day. Do not exceed the maximum dose.